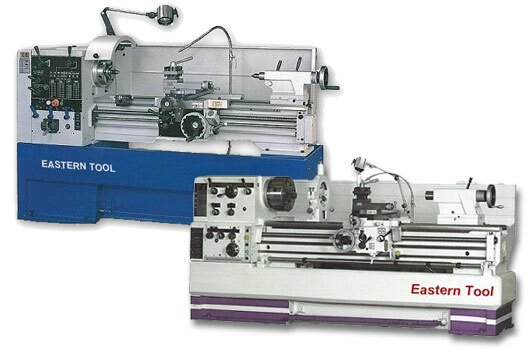 Eastern Tool’s Metal Turning machines have the features you want with the precision and reliability you can depend on for all your turning needs. Our lathes come with a full solid cast iron machine base for maximum rigidity, plus a front pull-out chip tray for easy maintenance. Large Swing models are the ideal lathe for the demanding workshop. For smaller turning needs, look to our Pedestal lathes. Its small size combined with a full universal gearbox means the full range of inch and metric threads can be set by just the levers, eliminating the need and hassle of change gears. This model is a favorite with small tool rooms and many technical schools. With the Pedestal machine you can get big work done at a fraction of the cost. You can expect only the best quality engineering with our basic models. They provide an incredible value with an unbeatable combination of price and performance. These machines have the power and precision needed to turn difficult-to-machine materials and heavy workpieces. For more precise, higher-power turning, check out our Large Swing machines. These reliable workhorses feature heavy-duty construction throughout to turn out big and heavy workpieces, a solid full-length casting base with front-loading chip tray for easier cleaning, adjustable overload feed clutches, and quick reversal feed from apron. Dependable and powerful, these highly accurate machines are built for machining with minimal downtime. Our 16-speed Clutch machines offer a variety of bore sizes, bed lengths and optional features. These provide rigidity and power built to perform and complete any task. From basic 2-axis turning to models with sub-spindle and live turret turning, there is a turning center to meet your needs. This heavy-duty gear-head lathe with a large spindle bore is the latest addition to our fine selection of machines. Its massive size and full capacities will allow you to chuck-up any heavy work piece with confidence. Whether you need to turn stainless, brass or large castings, its 13-3/4″ wide bed, heavy-duty tailstock, excellent speed range, coolant pump and powerful 10 HP motor will give you the best possible finishes. What’s more, each comes supplied with an auto apron stop so you can preset up to 4 different shoulders along the length of your shafting. With a quick change tool post, steady & follow rest and hex drive feed rod for smooth, consistent motion, you have the flexibility needed to tackle any job quickly.